After the success of the Sea to Sky Geo conference we were hired to create the website and conference management tools for this year\'s conference. We have taken the original website tools and enhanced them in many ways. 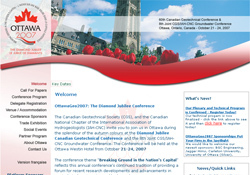 We have also just confirmed that we will be doing the 2008 conference.